I'm pretty sure than if you were blindfolded, you wouldn't be able to tell the difference between standard green cabbage and its more colorful relative - red cabbage. Or, really, it's purple. And while we're talking about colors, some people refer to green cabbage as white cabbage. 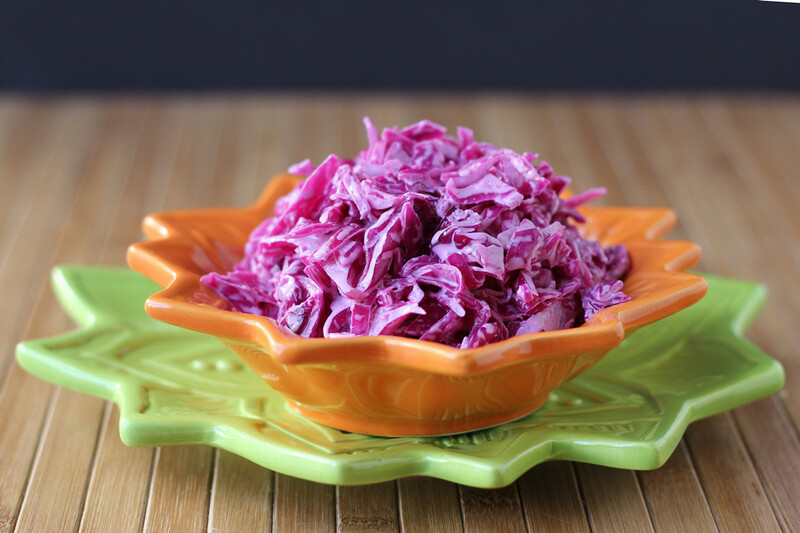 While green cabbage and red cabbage taste pretty much the same, they're often used in their own specific recipes - green cabbage ends up in cole slaw, sauerkraut, and stuffed cabbage, while red cabbage is often used for a braised sweet-sour recipe that shows up as a German side dish, right next to the spaetzle. 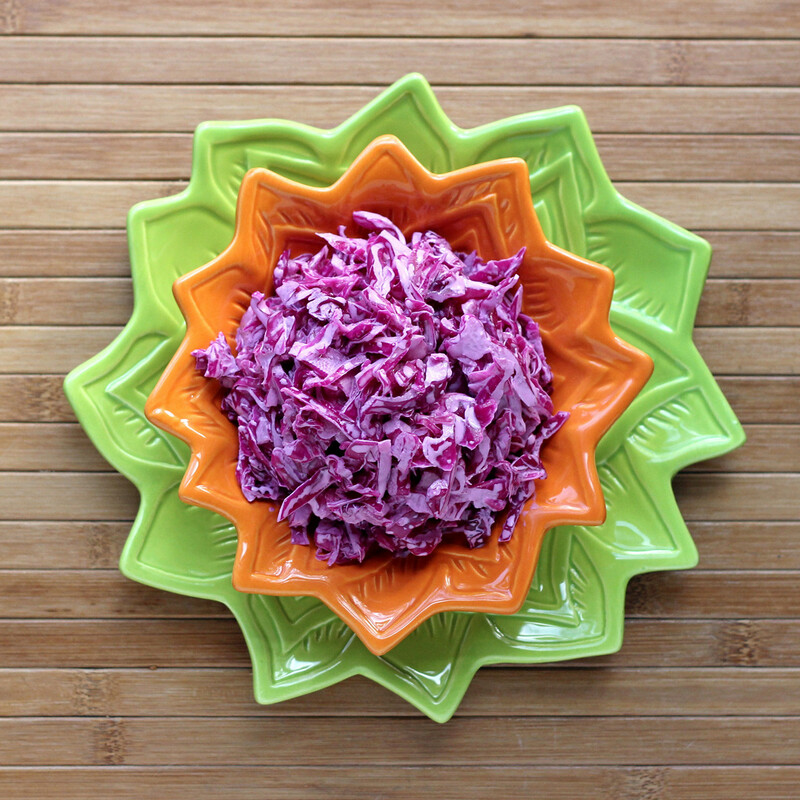 While I like cole slaw, sometimes I switch things up and use red cabbage, just because the color is so stunning. Chances are, there's nothing else on the table that color, while green and white are pretty common food colors. The little secret ingredient in this slaw is the horseradish - it gives the slaw a little bit of a kick - but it's subtle. The slaw shouldn't be spicy - it should just be less-than-bland. Commercial prepared horseradish varies in strength, so feel free to adjust as needed. Start small and add more, after you taste it. 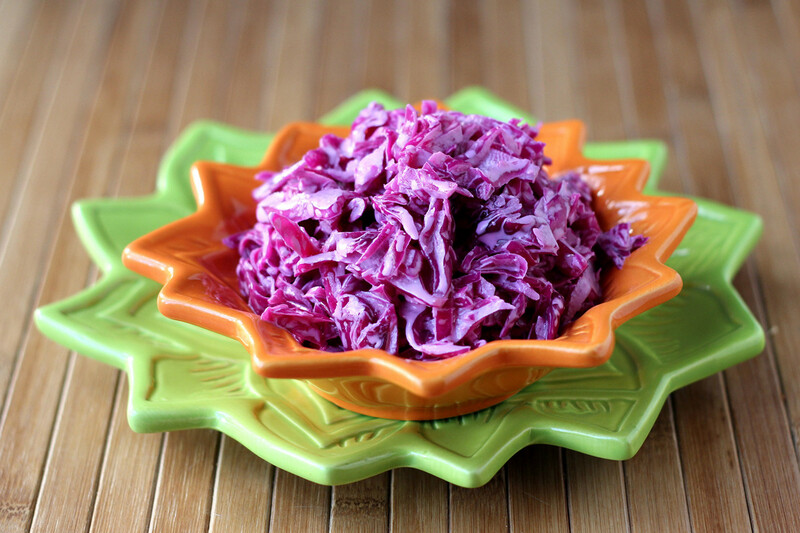 Cut the cabbage as desired some folks like thin shreds while other prefer a chopped slaw. Place in a large bowl. Add the cider vinegar, salt, sugar, and horseradish. Stir to combine. Set aside at room temperature for an hour, stirring occasionally. The cabbage will lose liquid and soften just a little. Drain the liquid from the slaw and add the yogurt and mayonnaise. Stir to combine. Taste and adjust seasoning as needed. If you prefer a creamier slaw, add more yogurt and/or mayonnaise. You can serve immediately, or refrigerate until needed. The dressing will be white when first mixed, but it will turn pink/purple as it sits.